It appears the saga of the “Silent Sam” Confederate memorial statue is coming to an end. 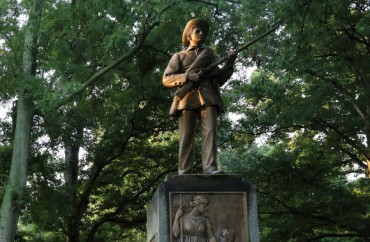 University of North Carolina at Chapel Hill Chancellor Carol L. Folt announced in a letter Monday that she has “authorized the removal of the base and commemorative plaques from the site” where Silent Sam had stood up until August. As reported by Inside Higher Ed, Folt “emphasized safety” in her decision, noting “a continuing threat to personal safety, community well-being and the university’s ability to provide a stable educational environment” if the statue’s remnants remain. The chancellor also announced she was stepping down from her post at the end of this academic year. Folt and Chapel Hill’s campus board had backed a plan to build a history center to house the monument and detail the history of race at the university. But the UNC Board of Governors rejected that plan in December. The debate over the statue’s future was not resolved when it was knocked down by protesters. Some called for the statue to be restored to its site. The state’s Republican former governor, Pat McCrory, had signed a law to prevent relocating or removing monuments on public property without permission from a state historical commission. In her letter, Folt did not draw an explicit connection between her decision to remove the monument base and plaques and her decision to step down from the chancellorship. But the system Board of Governors went into emergency closed session shortly before her announcement. Folt wrote that she has always been driven by the “new and the next.” As she reflected on accomplishments at Chapel Hill, she decided it was time to transfer leadership to a new chancellor and look toward her own future, she wrote. “While I recognize that some may not agree with my decision to remove the base and tablets now, I am confident this is the right one for our community — one that will promote public safety, enable us to begin the healing process and renew our focus on our great mission,” Folt wrote. Read the full article and Folt’s full letter.